Please visit our Current Vacancies page to see if we are currently advertising for Prison Officers and to register for job alerts when new vacancies arise. 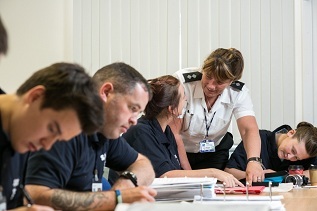 The recruitment process for Prison Officers is a robust and thorough process designed to deliver Prison Officers who demonstrate the key skills and behaviours required to be effective members of our professional team; the process may therefore take a number of months to complete. We appreciate your patience as we process your application and can assure you that we are doing so as quickly as possible. Experience in a people facing environment, demonstrating strong interpersonal skills. Experience of using computerised systems. Excellent communication skills and team working abilities. An awareness of and commitment to the SPS Vision and Values. Resilience demonstrated through patience and considerate interactions. The recruitment process begins with an online application form which gathers important information about you, including your motivation to become a Prison Officer and the skills and experience you will bring to the job. Your application will be checked to ensure it is fully completed and that you are eligible to apply for a role with us. Please visit the Your Eligibility page for further information. After your application has completed the initial screening process you will be invited to a testing and awareness session. We will invite you to complete two timed ability tests – verbal comprehension and numerical reasoning. These tests give us a fair and objective assessment of your ability to understand written and numerical information which are important in the role of a Prison Officer. We would encourage you to spend some time practicing sample tests so that you know what to expect. You can get practice in both verbal comprehension and numerical reasoning tests here. The awareness session does not form part of the assessment process and instead is designed to give you an insight into the structure and objectives of the SPS, provide you with more information on what the role of the Prison Officer involves and what it is like to work in one of our establishments. It gives you an opportunity to decide if this is a career you would like to pursue and the challenges and rewards it offers. If you are successful at psychometric testing, we will assess the evidence and examples that you provided in your application form. If your application form responses meet our requirements, you will be invited to attend the assessment day. During the assessment day you will take part in a competency based interview and a fitness test. You will be interviewed by a panel of SPS managers during which you will be assessed against the requirements of the role. This is your opportunity to showcase your skills and experience and share with us, evidence of your ability to be a professional Prison Officer. Due to the nature of the job, Prison Officers are required to possess a certain level of physical fitness and therefore you are required to take part in and pass a fitness test. You can access information on the fitness test standards and guidance on how to prepare for your fitness test here. The pre-employment checking process may take a number of weeks or months to conclude. On successful conclusion of your pre-employment checks you will placed on a list of Prison Officers waiting to be assigned to an establishment. Assignments take place on a regular basis and are dependent on operational requirements. We will contact you as soon as we can with your start date and allocated establishment and ensure you are ready to start your Prison Officer career.